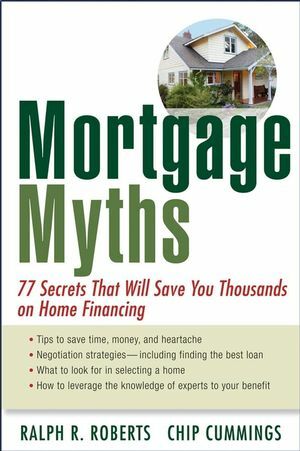 In Mortgage Myths, Realtor Ralph Roberts and mortgage consultant Chip Cummings take aim at the 77 mortgage myths that prevent so many would-be homeowners and real estate investors from pursuing their dreams of homeownership. You’ll learn the difference between good and bad debt, how to make mortgage approval easier and simpler, and how to use other people’s money to leverage your investments. This is the ultimate guide to getting the great deal you deserve. Ralph R. Roberts, ambassador of enthusiasm, has been dubbed by Time magazine "the bestselling REALTOR® in America." He is also an award-winning and internationally recognized speaker, real estate team coach, and business consultant, as well as the coauthor of Flipping Houses For Dummies, Foreclosure Investing For Dummies, and Advanced Selling For Dummies. Chip Cummings, CMC, is a twenty-three-year real estate finance veteran and has been an originator, broker, banker, and president of both large and small mortgage companies. He is an international speaker and business consultant, as well as author of ABC's of FHA Lending and Stop Selling and Start Listening! He has written dozens of articles for magazines and has been featured on various radio and TV programs. Section 1. Where Do I Start? Myth #1 - Renting is Better than Buying. Myth #2 - I Can't Qualify for a Loan. Myth #3 - Only U.S. Citizens Can Qualify for a Mortgage. Myth #4 - I Should Look at Some Houses First. Myth #5 - I Need a Down Payment - But I Don't Have the Funds. Myth #6 - I Should Make the Biggest Down Payment I Can. Myth #7 - Mortgage Companies and Loan Officers are Licensed and Regulated. Myth #8 - Big Lenders and Major Banks are Always Better. Myth #9 - My Best Bet is to Use a Friend (or Someone Local). Myth #10 - I'll Find a Better Deal on the Internet. Myth #11 - I Can Get a Higher Return by Investing in Stocks. Section 2. Playing "The Mortgage Game". Myth #12 - My Main Goal is to Snag the Lowest Interest Rate. Myth #13 - The Federal Reserve Controls Interest Rates. Myth #14 - Stay with "Fixed Rates" - ARM's Are Just Too Risky. Myth #15 - A Shorter Term Always Beats a 30- or 40-Year Term. Myth #16 - My Credit History Needs to be Perfect. Myth #17 - My "Credit Score" Determines My Loan's Approval. Myth #18 - Be Conservative - Don't Stretch Yourself. Myth #19 - I'm Divorced or Declared Bankruptcy... So I'll Never Qualify. Myth #20 - Special Financing Programs Aren't Available to Me. Myth #21 - I Should Avoid "Mortgage Insurance". Myth #22 - The "Good Faith Estimate" Guarantees My Closing Costs. Myth #23 - I Have to Use the Realtor/Builder's Loan Officer. Section 3. Selecting the "Right" Home. Myth #24 - I'll Save Big Money Buying FSBO. Myth #25 - I Have to Shop Within a Certain Price Range. Myth #26 - Everything Is Included in the Sales Price. Myth #27 - The Appraiser Will Specify the Value and Any Required Repairs. Myth #28 - The Real Estate Agent Will Protect Us. Myth #29 - Condos Are Bad Investments... and Hard to Finance. Myth #30 - Seller Disclosures are Complete and Accurate. Myth #31 - I Should Buy the Biggest House at a Bargain Price. Myth #32 - I Should Always Use an Attorney. Myth #33 - I Don't Need an Inspection - It Looks Great to Me! Myth #34 - I've Seen Enough.. I've Found the Home I Love! Myth #35 - It's Okay to Buy - This Area is Booming . Myth #36 - All Sales Agreements and EMD Requirements Are Standard. Myth #37 - I Can't Withdraw My Offer – It's Too Late. Myth #38 - Beware of Foreclosures - They're a Headache. Myth #39 - I Make Money When I Sell – Not When I Buy. Myth #40 - My Tenants Will Finance My Investment Property. Section 4. The Mortgage Process. Myth #41 - The Loan Process Takes a Long Time. Myth #42 - All Applications and Disclosure Forms Are Standard. Myth #43 - We’re Approved: Our Worries Are Over! Myth #44 - My Interest Rate Is Locked In AND Guaranteed. Myth #45 - A Pre-approval is a Pre-Approval. Myth #46 - I Have to Let My Lender Escrow Taxes and Insurance. Myth #47 - I'm Self-Employed - Getting Approved Will Be Tough. Myth #48 - The House Needs Repairs - We'll Do Them Later. Myth #49 - Personal 'Profiling" Is Part of the Approval Process. Section 5. It's "Closing" Time. Myth #50 - Someone Else Decides the Closing Date and Location. Myth #51 - Why Do I Need "Title Insurance"... I Can't Even Select the Provider. Myth #52 - It's Cheaper to Close at the End of the Month. Myth #53 - I Can't Review Documents in Advance. Myth #54 - The Seller's Home Warranty Protects Us. Myth #55 - The House Will Be in "Move-In" Condition. Myth #56 - It's All Triple-Checked and Ready to Go! Myth #57 - I Need Homeowners Insurance to Cover the Entire Purchase Price. Myth #58 - I Need Credit Life Insurance to Protect Myself. Myth #59 - My House Payment Will Never Change. Section 6. The Refinance Game. Myth #60 - Never Refinance Until the Rate is 2% Lower. Myth #61 - I Should Never Refinance Into a Higher Interest Rate. Myth #62 - I'm Not Allowed to Pay Extra - There's a Pre-Payment Penalty. Myth #63 - Reverse Mortgages Are a Bad Idea. Myth #64 - My Terms May Change if the Loan is Sold. Myth #66 - Refinancing: Better Than Home Equity or Construction Loans. Myth #67 - Low Inflation Means Low Appreciation. Myth #68 - I Have to Live There at Least 3 Years to Break Even. Myth #69 - Refinancing is a Cheap Way to Get Cash. Myth #70 - My Escrows Are Already Set Up. Section 7. Short of Cash? Creative Financing Solutions. Myth #71 - I Can't Use a Gift for a Down Payment. Myth #72 - A Bi-Weekly Mortgage Simply Changes My Payment Schedule. Myth #73 - Seller Financing is Risky and Expensive. Myth #74 - Government Loans Are Only for Low-Income Borrowers. Myth #75 - No Bank Will Finance Us. Myth #76 - A "Lease Option" Plan is Always a Bad Idea. Myth #77 - I Can't Make My Payments... So I'll Lose My Home. Mortgage Application - Form 1003. Sample "Truth in Lending" Disclosure. National/State Associations and Regulatory Agencies.